We believe education is the way forward, so we help you prepare for and achieve your dreams . . . even those you perhaps didn’t initially imagine. At Saint Mary’s, you’ll learn and grow, and we provide ample opportunities along the way to ensure your future success. Across majors and disciplines, you’ll find that a Saint Mary’s education is a tremendous value—one that gives you once-in-a-lifetime, hands-on experiences and practical instruction that can be put right to work in your career or graduate studies. Our graduates prove time and again that a Saint Mary’s education leads to career and life success. Each year we ask our most recent graduates to share their early career outcomes. Six-to-12 months after graduation, 25% of graduates were continuing their education or planning to continue their education—pursuing advanced academic or professional degrees or certifications—to further themselves in their chosen fields. Alumni who pursue graduate studies in one of Saint Mary’s 40+ advanced degree programs may find themselves on a new campus—or online—but they experience a familiar, challenging yet supportive Lasallian academic environment and culture. 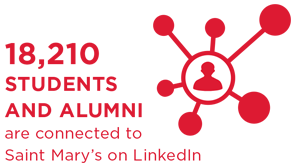 Saint Mary’s graduates become part of the university's 42,000+ loyal alumni in Minnesota and throughout the world, many of whom are interested in helping new alumni make connections in their chosen professions. Where do Saint Mary’s students go from here? Hear from our alumni. Allie Thiel managed to “do it all” as a student. Along with a challenging major, she played french horn and ran for the cross country and track teams. She completed the prestigious Mayo Innovation Scholars program with Mayo Clinic, and conducted cancer research supported by R&D Systems and the Beta Beta Beta National Honor Society. Allie was named the top oral presenter at the 2016 Winchell Symposium at the University of Minnesota, and she was invited to present her senior thesis cancer research at the Beta Beta Beta national convention. She is currently a patient care technician at a medical center in Hinsdale, Ill., with plans for medical school to specialize in internal medicine. Katie Leisen was always drawn to a career in science, enjoying the hands-on work and the potential to truly help people. Now attending law school, Manire Vaughn’s interest in becoming an attorney was influenced by the hands-on experiences Saint Mary’s provided. Preston Black ’15 landed a job with the Los Angeles Rams just two months after graduating from Saint Mary’s University. As a data analyst and business intelligence coordinator, Black works in a Customer Relationship Management (CRM) system and deals with all aspects of business for the Los Angeles Rams, from concessions to ticket sales to sponsorships, linking all aspects of the business, from finance to customer service, so each area is in communication. As coordinator of public relations for the Chicago White Sox, Julianne Bartosz ’13 contributed to first baseman Paul Konerko’s nomination for the Roberto Clemente Award (which he co-won and was awarded before Game 3 of the 2014 World Series). In her dream job, she also worked on the script for a pre-game ceremony honoring Yankees legend Derek Jeter on the afternoon of his last big league game at U.S. Cellular Field. An entrepreneur and self-proclaimed foodie, Zachary Cizek ’11 turned his love for sandwiches into a successful food-stand business based out of Chicago. From there, Cizek created Bollito’s Tuscan Red Sauce, now sold in Chicago and in all 56 Midwest Whole Foods Markets. Currently Cizek has plans to launch additional sauce varieties and also to expand into the salad dressing market. A Chicago native, George Stephenson graduated from Saint Mary’s with a degree in education and went on to attend law school at William Mitchell. He has served admirably as an attorney and federal defender for the City of Saint Paul and was appointed and re-elected as judge for the Ramsey County District Court. He is an active volunteer and mentors young lawyers and those interested in a career in law. A professional actress and theatre professor, Celeste Williams’ Chicago credits are numerous. She is a member of the Columbia College theatre faculty and has twice received the “Best Featured Actress in a Play” award from Black Theater Alliance Awards, Inc. Williams’ acting career began on a much smaller stage at Saint Mary’s where she received her degree in theatre. McDonough’s tenure as President and CEO has corresponded with the Chicago Blackhawks winning Stanley Cup titles in 2010, 2013, and 2015—the first organization in the NHL’s salary cap era to capture three championships. The university community is regularly inspired by McDonough, a Saint Mary’s communication arts major who continues to support Saint Mary’s in many ways.